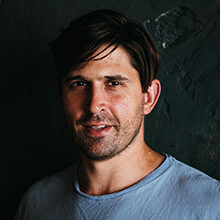 Robért LeBlanc is the founder and creative director of LeBLANC+SMITH, a boutique collection of restaurants and bars focused on creating culturally relevant experiences through superlative food and beverage programs, timeless design and a prevailing sense of southern hospitality. The LeBLANC+SMITH portfolio is comprised by Barrel Proof, Cavan, Longway Tavern, Meauxbar, and Sylvain. LeBlanc’s latest project, The Corsair at 4125 St. Charles Avenue, is a boutique hotel, restaurant, and bar opening in Fall 2019. A Houma, Louisiana native, LeBlanc graduated from Vandebilt Catholic High School and went on to earn a Bachelor of Science in economics and finance from Loyola University New Orleans in 2000. During his time in school, LeBlanc fell in love with the city of New Orleans. LeBlanc has since devoted his life to his family, alma mater and community. Leblanc began his career in the music industry, first starting Renaissance Records, a record label that produced local indie rock and hip-hop records, and eventually Renaissance Initiative. As the city started to rebuild after Katrina, LeBlanc and his partners founded Lifestyle Revolution Group, an entertainment development company. They started with just one music venue in New Orleans' Warehouse District, Republic New Orleans, and it later evolved into a company to develop, market, and manage entertainment spaces such as restaurants and bars. In addition to creating a positive social atmosphere for New Orleanians, LeBlanc also aided the city in hosting fundraisers for a variety of local organizations such as the New Orleans Ballet Association and the New Orleans Film Festival. In 2007, he was named to Gambit Weekly’s 40 Under 40. LeBlanc currently serves on Loyola’s Board of Trustees where his core responsibility is in Institutional Advancement. In this role, LeBlanc helps with university branding to specifically work on how the university engages students and alumni. LeBlanc has also served as an Executive Mentor at LOYNO and has sat on the Visiting Committee of the College of Business. He also served as Vice President on NOCCA Institute Board of Directors (2017-2018). LeBlanc is married to his wife Danielle and together they have two sons, Bear and William.